It's super easy to get setup and start sending information from TOTAL to Anow! 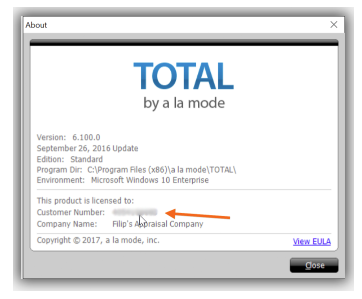 Before you begin, you must ensure that you have the Anow add-on from the TOTAL a la mode store. Obtaining the add-on through the a la mode store adds the functionality to the desktop of everyone in your company. Next, you need to add your TOTAL Customer Number into Anow. You can find your TOTAL Customer Number by clicking Help/About in TOTAL. There you can view Customer Number under the License to: section. Once you have your TOTAL Customer Number, you will need to enter that number into Anow. To do this, access your Account in Anow and select the Company Settings tab. Scroll to the bottom of the page until you see the Integration Keys section. Click Edit, make sure TOTAL and CUSTOMER NUMBER are selected, then paste your TOTAL Customer Number in the field. Be sure to click "Save" before you leave! 1) Select Anow in the TOTAL store to push appraisal details to Anow. Only one record can be pushed at a time. 2) Your browser will open a new window with Anow loaded in it. If you are not already logged into Anow, you must login now. 3) The Data Import Wizard should open automatically. Follow the prompts to import your order, and be sure to click the final Add Property button to add it into the Anow system. 4) Your TOTAL data should now be listed as an Appraisal in Anow! 5) At any point, you can view all your orders (TOTAL as well as Web Orders from the Web Order form) in your order desk on your dashboard.